Weston | Village Building Co.
A flexible range of innovative housing options is coming to the much-loved suburb of Weston in a beautifully landscaped setting that reflects the natural aesthetic of this established inner-Canberra suburb. Whether you're looking to buy your first home, find a bigger one or downsize, this new housing community will include urban terraces, townhouses, apartments and house and land packages to suit everyone, with the added benefit of communal gardens, BBQ areas and open spaces. On 26 November 2018 Village submitted its preliminary draft Estate Development Plan, draft traffic report and other supporting documents to the Environment, Planning and Sustainable Development Directorate (EPSDD) for initial review, completeness check and initial circulation to Government Agencies. At the completion of the government agency review process the EDP, traffic report and other supporting documentation will be amended and published on our website http://villagebuilding.com.au/developments/act-weston whilst also being communicated through the Weston Creek Community Council (WCCC). 21 August 2018: A summary of the feedback received during the pre-DA community consultation process can now be downloaded here. 10 August 2018: A summary of feedback from the consultation process is currently being collated. 08 August 2018: The pre-DA community consultation process has concluded. 26 July 2018: Thank you everyone who attended the WCCC General Meeting last night where we presented the revised concept plans. We will collate your feedback from the night and the coming days and share them on this website. ​25 July 2018: The Traffic Impact and Parking Assessment can now be downloaded. 16 July 2018: We have released revised concept plans for public comment. A series of revisions were made to the original plans in response to feedback from the community, which was collected during the ongoing community consultation. We look forward to hearing your thoughts on the revised plans and we thank you for all the input we have received to date. Together we will build a really special precinct in this fabulous location. 16 July 2018: In recent weeks, we conducted a traffic impact assessment to address traffic concerns raised by the community and minimise the impact of the development on Weston Creek roads. We have engaged an independent consultant to peer review the Traffic Impact Assessment and will provide details as soon as they are available. 22 June 2018: The Pre-DA Community consultation period has been extended to 8 August 2018. The plans below were released on 16 July 2018 for public comment. The next version of the masterplan will be published as part of the lodgment of the draft Estate Development Plan to government and for public notification and assessment in April 2019. *reverted back to two in light of feedback received. The design incorporates modern design and natural, local materials with the community feel of an established suburb. The site will be opened up to allow neighbouring residents to enjoy the green spaces and connect to Fetherston Gardens. The number of dwellings has been reduced to 247-250. The three-storey apartments have been located towards the inside of the site as the land falls away to the north, creating no visual or shadowing impact on existing residents in Heysen St.
Townhouse footprints have been tightened up with undercroft parking to release more usable, open and consolidated landscape space. Townhouse densities increase towards the middle and northern (Unwin St) side of the site providing good product diversity for a range of demographics. By April 2019, we anticipate that the Estate Development Plan, traffic report and other supporting documentation will be amended and published on our website http://villagebuilding.com.au/developments/act-weston and also communicated through the Weston Creek Community Council (WCCC). We appreciate all of your feedback at this early stage. Village is liaising with relevant agencies and community stakeholders including Transport Canberra and City Services and Fetherston Gardens to get their input into the design and help respond to community concerns. Summary of Feedback from the pre-DA community consultation. Why have you changed from seeking a DA to following the EDP process? Our original intention was to lodge a Development Application (DA) however, to facilitate a community titled development, approval is best sought under an Estate Development Plan (EDP). The EDP process is a lengthier and more complex process than aDA. The final draft EDP is unlikely to be lodged until approximately April 2019, much later than our original intention to lodge a DA in September 2018. The preliminary draft EDP submission includes the latest draft Masterplan for the site which we expect to be amended multiple times in response to comments by government agencies during the review process. To avoid confusion, the final masterplan will be available for viewing during the formal EPSDD public notification period, anticipated for April 2019. Are you planning to increase the number of dwellings or the density of the development? There will be approximately 250 dwellings. We are refining the housing product mix and location within the current plan There are height limits of two storeys along Heysen St and opposite the Oriana school, with three storeys permissible elsewhere. Have you changed the number of access points along Heysen Street as was recommended during the community consultation process? We expect sales to commence in the second half of 2019 subject to the approval process. Hands Across Canberra Weston Charity House: Is the next Hands Across Canberra Charity House going to be built in the new Weston precinct? Yes. We are partnering with the Master Builders (ACT) and charity foundation Hands-Across-Canberra to build a Charity House, which will be auctioned with the proceeds going to vulnerable Canberrans. The actual Charity House has not been identified yet but it will be one of those built as part of the Weston project. Latest timelines: What is the latest on the Weston project timetable? We are working through the pre-Estate Development Plan (EDP) application process but it is taking longer than we initially anticipated. As a result, we now plan to submit the EDP towards the end of the year (instead of September as previously communicated). How are you going to address traffic issues along Heysen Street? Since the 25 July meeting, we have committed to again reviewing the access points on the site. We commissioned a peer review of the traffic impact and parking assessment, which will give us additional insight into the potential impact of the development on traffic and roads in the area that we will pass on to the Government. We will represent the community as best we can in taking the residents’ concerns to the Government together with the WCCC. Village conducted a traffic impact assessment in recent weeks that indicated the surrounding street network was currently performing within the standard ACT guidelines. We have engaged an independent consultant to peer review the Traffic Impact Assessment and will provide details as soon as they are available. Contact the Weston Creek Community Council at info@westoncreek.org.au or call them on 02 6288 8975. If you have queries about the consultation process, contact Canberra Town Planning at admin@canplan.com.au or on 02 6262 5091. We will continue to update this website with details of the upcoming process. If you were not able to contribute to the pre-DA consultation process but still want to provide comment, please contact the Weston Creek Community Council at info@westoncreek.org.au or call them on 02 6288 8975. This ensures that community feedback is coordinated through a single source. The house, to be built in our Weston development, will be auctioned with the proceeds going to numerous local Canberran charities under Hands Across Canberra. 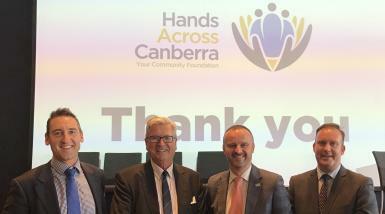 ACT Chief Minister, Andrew Barr, made the announcement of Village’s contribution to the initiative at the Hands Across Canberra annual fundraising luncheon on Friday, 26 October 2018.